It’s been a very cold and snowy start to the winter here in the East, so I felt fortunate to squeeze this trip in as it is rare to get a schedule to cooperate for two games in the Lake Effect Snowbelt. My drive up to Rochester was uneventful and timing couldn’t have been more perfect as I arrived at RIT’s Gene Polisseni Center right as the gates opened at 5:30 PM. That gave me plenty of time to take a tour at this beautiful facility built in 2014. The entrance is my favorite part of the arena as you enter into an atrium at ice-level that is accented by orange walls and a holographic-like Hall of Fame display. Given that this is the Rochester Institute of Technology, it was cool that they showed their stuff by having a pretty neat Virtual Reality experience. Upstairs, the area above the seating allows more room to walk around, view displays, get food or use the standing rail to watch the game. It’s probably one of the best concourse set-ups I’ve seen for a small hockey arena. The bowl itself rounds the rink in standard fashion and it is adequate, though the seats are a little tight. The most enjoyable part of the arena experience is the Corner Crew, RIT’s student section. While the rest of the crowd was surprisingly sparse and quiet, these guys and gals in Section 118 made their presence known. They were full of chants and choreographed cheers with my favorites being their rendition of “Happy And You Know It”. Their arm-bopping to “Jump Around” was great too. I got to see their post-goal traditions three times and it involves a siren, bell and “We want _#, It’s all your fault”. I’ll have some videos up on YouTube after the official review. The section doesn’t quite reach the level I saw at Michigan last year, but RIT has a noteworthy solid group nonetheless. The action on the ice was great as Sacred Heart went back and forth with the Tigers. RIT’s goals were quite entertaining, while the Pioneers were quite fortunate. They had a fluky goal in the 2nd period that came from a hot rebound off the backboards. 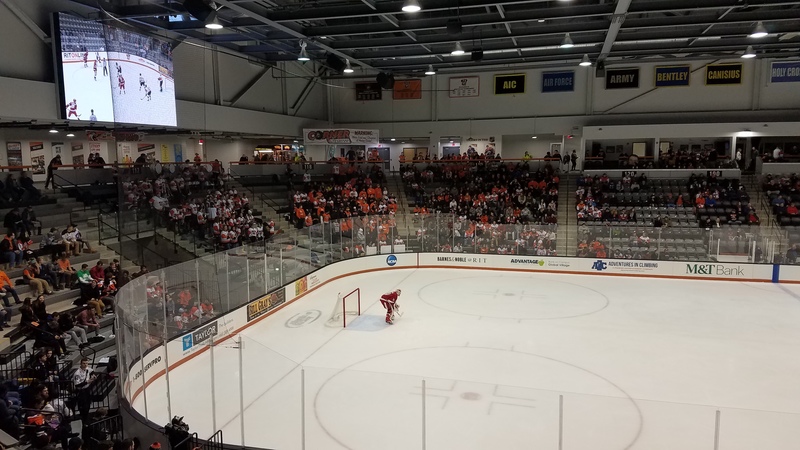 After RIT lost the lead in the 3rd, the game went to OT and with less than 10 seconds to play, Sacred Heart was the benefactor of a bouncing puck that hopped into the air, bounced around, and eventually landed on the goalie’s back, where it barely fell over the goal line. Rough loss for RIT, though Sacred Heart did carry most of the play in the final 25 minutes. The next day, I briefly stopped back at RIT to get some outdoor arena pictures (never fun with bare hands when it’s 25 degrees) and then made the drive to Olean. Similar to my last trip in 2002, I ran into light snow as I got into the Allegheny Mountains. This thankfully didn’t stick to the roads, but it made for a classic Winter background as I reached Saint Bonaventure. The setting may be pretty, but this is a campus that looks like it is stuck in the 1970s and the generally dull brick buildings don’t help with appearances, though a few statues add unique elements. The Reilly Center has a similar vibe with occasional wood-paneling and white-tile ceiling. It is an especially funky building with its numerous hallways and corridors that lead to many non-basketball things. 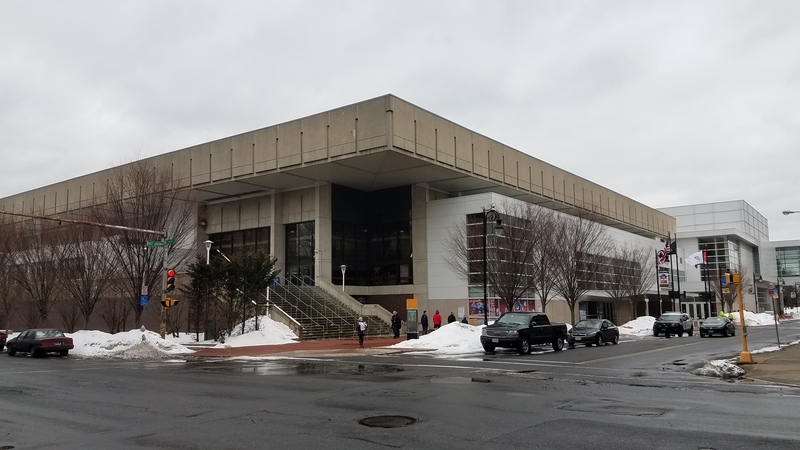 It’s not everyday that you see a post office, a bookstore, a cafeteria and a replica of the Declaration of Independence all in the same building that houses a sports arena. Inside, it’s a simple facility with sideline seating that is broken up twice by a walkway. On the ends, there are small bleachers that contain students and the pep band before quickly reaching a wall. I was particularly interested by the seats that seemed original based on the wooden armrests and the unique cushions, that were quite comfortable. Saint Bonaventure has always been regarded as a tough place to play and the Reilly Center was absolutely rocking for this one. Buffalo was in town and they came in undefeated and ranked in the Top 25 for the first time in their history. The Bulls showed why as they ran over the Bonnies, dominating from start to finish in an 80-62 win. Yet, it was the fans I noticed the most as they are so loud and into it. The place went bonkers when the Bonnies cut the lead to 15 (that’s 15!) as people got on their feet trying rally them on. The students were crazy loud, but they were also out of line and exceptionally vulgar. Just before the teams came out, they chanted “F*#& UB”. Thankfully, they didn’t do that during the game, but c’mon it’s a Saturday Afternoon and there were plenty of kids on hand. The rest of the way, the group chants were acceptable (I’m ok with “You Are Ug-ly”), but there were a few individual shouts that crossed the line. 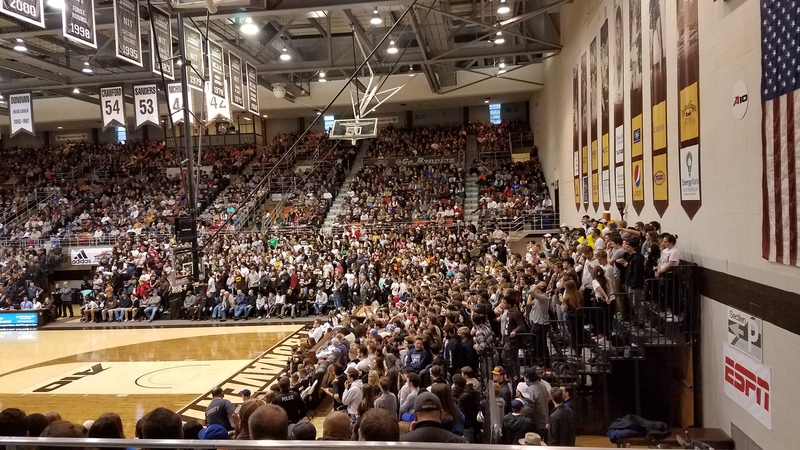 I loved the passion and volume of the Reilly Center, but occasionally cringed at the student section, especially from a school that preaches Franciscan Values. Last week, I said I didn’t mind the cold as long as it was dry. I lied. My 155lb body struggles mightily to retain heat and the 40 degree, 30 MPH conditions on the Main Line just outside of Philadelphia made it a bear to get through the football game at Villanova. Despite the few fans in attendance, I struggled to find a spot in the stadium that was protected by the wind until the second half, where I decided to stand in a corner to get some wall protection. In between, were trips to the tiny bathroom under the main stand, where others joined to crowd around a space heater. It’s too bad that Villanova’s Stadium disappointed as well. There is a set of bleacher stands on each sideline, but they are pushed back because of a track and they are low to the ground, meaning that sightlines throughout are poor. Even worse was the lack of a concourse as two tiny openings under the bleachers led to a bathroom. People maneuvering around the stadium need to use the track or a walkway in front of the seats. Just a poor facility all around. Most of the fans abandoned the game in the second half and they missed a late Villanova comeback. The Wildcats were down 24-7 to William & Mary in the 4th Quarter and they eventually cut the lead to seven. Villanova had a pair of attempts at the end, but they fumbled and had a loss of downs to lose 24-17. Before the game, I did take a bit of time to walk around campus and it is a really pleasant one. 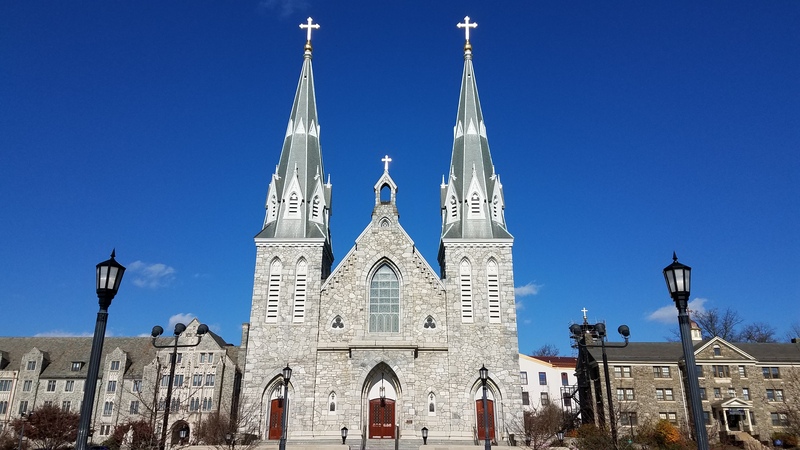 Most impressive is the Saint Thomas of Villanova Church. I’m looking forward to getting back here for a look at their renovated basketball arena. 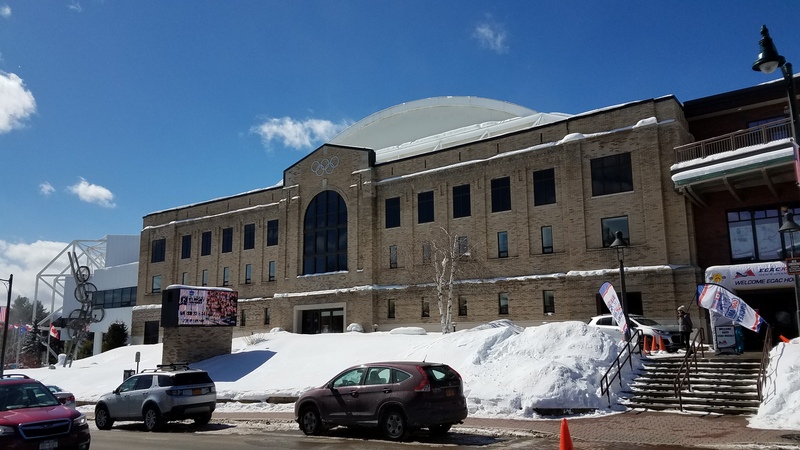 The next two hours were spent warming in the car on the way to Hershey, PA, where I would have my second look at an AHL facility that is at the tops of the arena rankings. 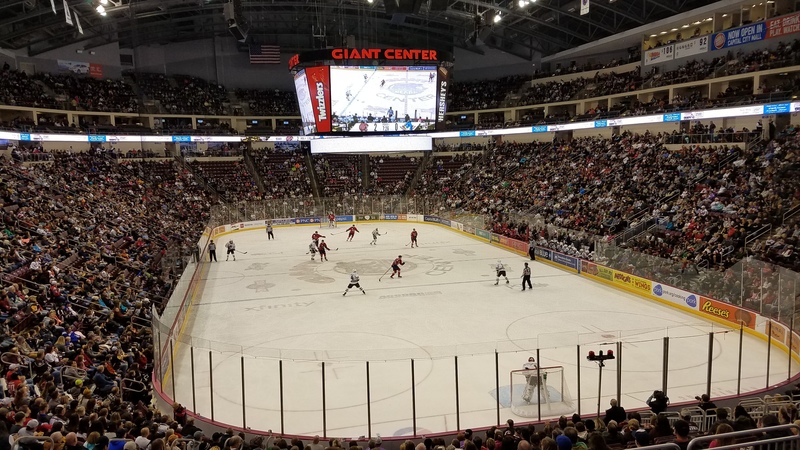 Giant Center is a great building that is really clean and features plenty of historical displays that rightfully honor minor league hockey’s most storied franchise. The inside has an excellent design for hockey. The arena has some character (like the chocolate coloring all around), while checking off all the requisite boxes. I did note a few things that I didn’t pick up last time: the concourses are very crowded and some of that has to do with unnecessary merchandise stands that stick out into the walkways. Also, the upper deck here is really high as the middle suites and wall seem taller than normal, thus pushing them upwards. When I do the re-review in the next week, we’ll see if Hershey holds it place at the top and I have a hunch they will as the place still shines. Fans remain great here and though the arena was 60-70% full, it was a loud building. They make the atmosphere stand out with their “B-E-A-R-S Wooooo” cheer after goals and their old school jeering of referees and heels from the visiting team. Even after the game, calls of “Woooo” resonated throughout the parking lot as fans went home happy with Hershey beating Springfield 3-2. Getting out featured a lot of congestion as a high school football game at nearby Hersheypark Stadium finished around the same time. Otherwise, it was smooth sailing on the ride back home. It was a cool, drizzly start to the day as my brother and I headed out from New Jersey, just after the Morning Rush. The nearby steady rain moved faster to the northeast than our drive and it was nice that our walk around the area would be mostly dry. Boston is one of the cities I vow to never drive in, so we parked in the Alewife Station and took the T a few stops to Harvard. More on that horrible train station later. Cambridge is a cool hybrid between a city and college town and we explored on foot before taking a tour of Harvard. If you want to save money, avoid the ~$20 “Hahvahd Tour” that is advertised in the Square and head to the Information Center building on Dunster Street to sign up for a free, student-led tour. Our guide did a nice job and we enjoyed the introduction to the famed school. Campus had it’s nice spots, but I’ve been to plenty of other Universities that were much more appealing. Dinner was an early one at the Russell House Tavern. It was a 15-minute walk down JFK Street from dinner to reach Harvard Stadium. The sight was one to behold as the historic building appeared and I felt we were a world away in Greece. The concrete exterior full of open archways gave way to a horseshoe-shaped interior that featured a walkway around the top, framed by Greek-like columns. Even more ancient were the seats, err, I mean concrete slabs that were equally fascinating and uncomfortable. While the debate between comfort and nostalgia raged in my head, there was no denying the terrific sightlines in the bowl and the close proximity to the field. The game below featured a 2-0 Crimson team that took on Rhode Island and it was the Rams that got the road victory. Their QB, JaJuan Lawson didn’t seem to miss in the first half. As Rhody slowed down in the second half, Harvard made a comeback and they cut the lead to 23-16. However, their four chances with possession in the final seven minutes all failed to get a touchdown and the Rams went back to Kingston happy. The walk back to the T station in Harvard was pleasant thanks to the acoustic outdoor vibes as people were enjoying a Friday Night out. The subway ride was simple enough, but it was the awful Alewife station that hampered the departure. Aside from the fact that the parking garage itself is literally a hazard by falling apart, we could not find our way back to the car thanks to the lack of signage. Arriving from a part of the station that is not connected to the deck is not obvious for visitors. After figuring out where we were via Google, we then searched forever for a pay station and while signs are abundant to pay for exiting, machines are just the opposite. I gave up as the place started to get creepy and we ended up at the actual exit with no way to turn around. As I put my flashers on to go on the hunt again, a worker came up from the crypt to let me pay with a Credit Card. Ugh that place is a disaster. Once we got out of Alewife, the hotel in Waltham provided a good night sleep and we headed out to Boston College a little after 9 AM. 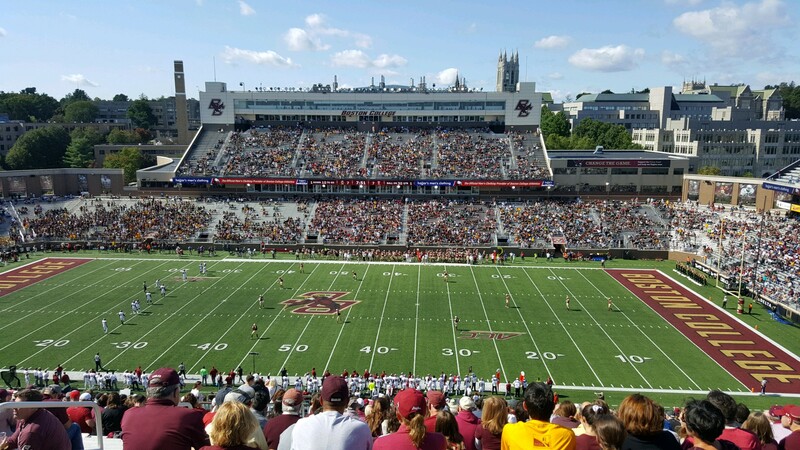 We weren’t a season-ticket holder, nor planning on tailgating for $40, so we used a satellite parking deck in Needham, then took a shuttle over to Chestnut Hill. Not that I’m advocating getting rid of jobs, but the folks at LAZ Parking should reconsider how many are needed to direct cars into the 5th floor of a parking garage in a business complex on a Saturday. It was comical to the point of laughing out loud at the double digit number of employees it took to “direct” you up a ramp and then point to the obvious location of the shuttle bus. Well, it’s better than the opposite and if I have to park away from the stadium, BC did a great job making the process seamless. We purposely got there early, so that we could walk around and take in the sights on this gorgeous campus. Everyone will want to go check out Harvard, but Boston College is the prettier one and well worth a look. As one of the first college’s to be designed in the Gothic style, Gasson Hall is exquisite and Bapst Library beautiful. Campus is hilly and to get to Alumni Stadium, we walked down several flights of stairs, where we reached a nice mix of tailgaters along Campanella Way. The Stadium itself isn’t anything special as the bleachered layout features a complete lower deck and then four, separate sections comprising of an upper deck. 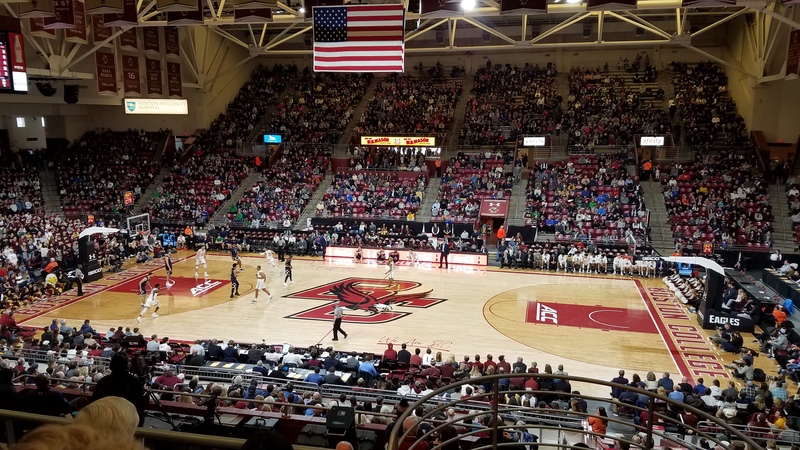 I did find the attachment with Conte Forum to be unique and was happy to see it open for exploring (they even use concession stands inside as they share the area with the stadium). I also found Alumni Stadium to be intimate and the setting to be nice, especially from the East Stands with Gasson Hall in the background. The game was against Temple, making it a “Conference” game in my fantasy world. You see, I’m a firm believer of geography dictating conferences and I was one that really disliked BC’s move to the ACC. I get it, but don’t like it. So, my conference (let’s call it the “Big East”) would be: Boston College, Buffalo, Connecticut, Massachusetts, Pittsburgh, Penn State, Rutgers, Syracuse and Temple. Hate away Happy Valley! The game was a high-scoring affair and BC continued piling up points with their no-huddle offense. They won 45-35 and RB A.J. Dillon was stellar again with 161 yards and 2 TD on the ground. At times, the game was entertaining, but I still am astounded to see how college football doesn’t get more flak for game length. This one was eight minutes shy of 4 hours and it featured way too many replay reviews. My brother and I passed the time by quoting Step Brothers and seeing how many situations we could apply the “Trophy Fish” line. The crowd was slow to arrive and for the most part, tepid, though they did rise to their feet and give a nice pop during touchdowns. 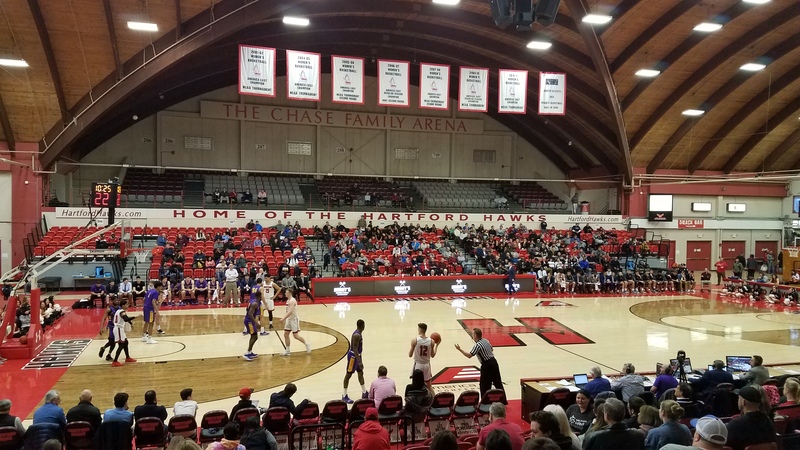 Students showed up for the first half and then remarkably disappeared for the second half as less than 50% returned to their seats after the break. I did enjoy their sing-a-long to “Mr. Brightside” by The Killers. Didn’t know this was a new tradition and it was a nice surprise. I also liked “Ring the Bell”, something that made sense given the daily chimes that go off on campus. Travel day. We started in the rain, but it wasn’t too bad and it was over by the time we reached Maryland. Hoping that’s the last of the wet stuff that we see all week. Our rough halfway point was Hagerstown, a city I’ve seen before on a visit to Municipal Stadium. Today, we took the little one to Discovery Station for some running around followed by a bagged lunch. After more driving, the end of the road was Wytheville, VA.
What a beautiful day. 75 and sunny with conditions perfect for our final drive through the mountains to Asheville. We actually went a good distance past the city to visit Chimney Rock, about 40 minutes to the east after traversing the curvy Rt 74-A. The slightly nauseous ride was worth it once got to the tiny charming town and the Rock that towers above it. There’s a lot to do here with several great trails, but the main one was time-consuming and energy-sapping enough for us. 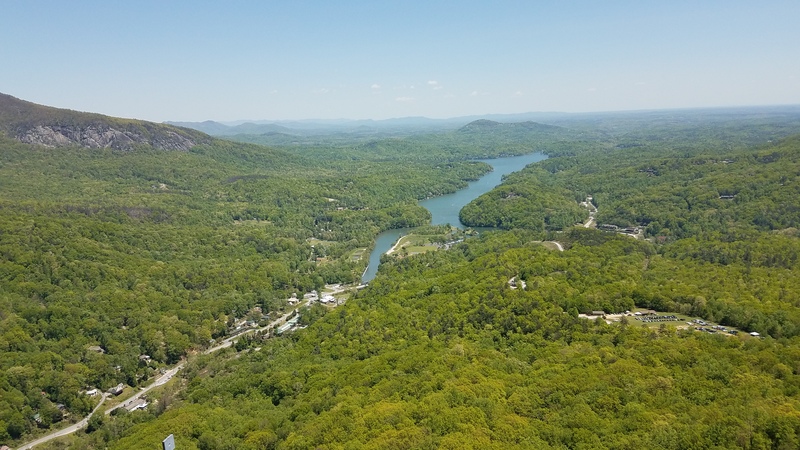 499 steps brought us to the top of the famed granite outcropping with a view that was worth every step. Our 3-year old Shayla amazingly climbed probably 75% of it as her extra weight only needed to be carried down the stairs. She gave a “wow”, a few times, mostly at some of the neat side attractions on our way up. After a little break, our baseball game had an earlier 6 PM start and we headed over to McCormick Field at about 5:15 PM. That still was not enough time to find a parking spot in the tight surrounding area and we were forced to drive around side streets, looking for a place to park and accepting a long walk. I’ve been to 55 minor league ballparks and this is the worst parking situation I can remember. Once that debacle was over and our tired legs climbed up another hill to the entrance, I was able to enjoy a quirky ballpark with a lot of character that I really enjoyed. The elevation sets the frame for a unique concourse and inside, it gives a great view beyond the outfield. The seating bowl has the grandstand that I always appreciate. A nice crowd was on hand and they were treated to one of the best baseball games I’ve seen in awhile which included: five home runs, benches clearing after high heat and a home team comeback. Chad Spanberger’s three-run homer in the 7th put the Tourists up for good as the crowd went crazy. 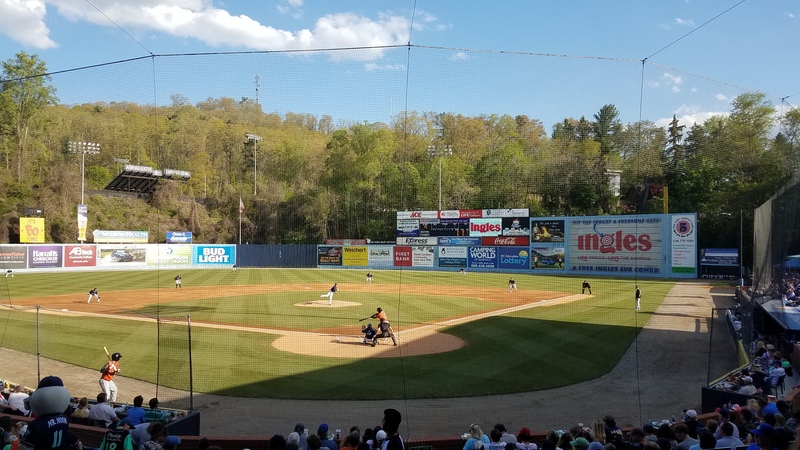 Asheville won 10-8 in a great showcase for McCormick Field. This day was all about exploring Asheville and the perfect means for that is the Hop-On Hop-Off Trolley Tour. With entertaining storytellers giving us insight to this remarkably historic city, we rode along while getting off at some sites. Grove Park Inn is remarkable and the Biltmore Village is a great little spot as well. Downtown, we checked out a lot of the main sights and the preserved architecture is awesome for nerds like me who enjoy that stuff. Austin is the capital of “Weird”, but I feel like that saying should be “Keep Asheville Weird” as it fits better here. There is such a collection of unique folks that make this city a quirky and fun place. A hipster’s paradise. For food, we enjoyed meals at Tupelo Honey and Luella’s, where my BBQ is a little backwards. They have an Eastern-style and I’ll wait til Wilmington (in the East) for the pork taste usually reserved for the Mountains. 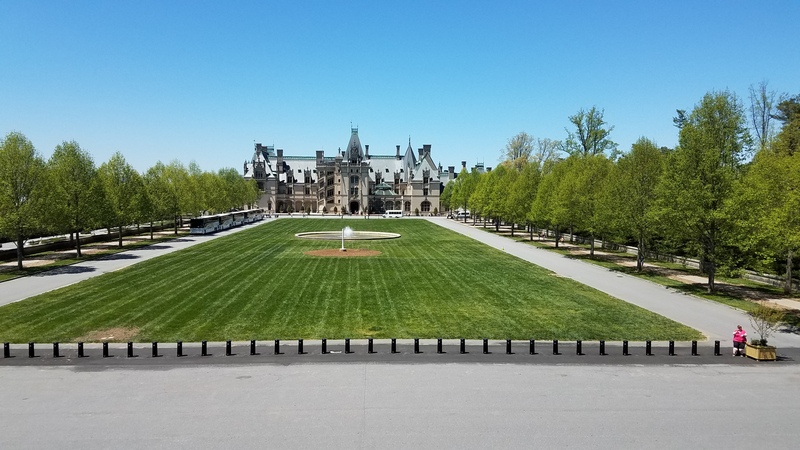 We’ve been very fortunate with weather and it was a gorgeous day as we spent it at the Biltmore Estate. Yes, this place is so big that it was a day-long affair. My wife, Cheryl, has always wanted to visit, so I took Shayla for a few hours in the morning to the Antler Hill section and let her play in the playground and barn while Cheryl got some needed alone time in the house. This is the closest I’ve felt to Downton Abbey and the whole place is incredible. Some stats from this French Renaissance Chateau built by the Vanderbilt’s in the late 1800s: 249 rooms, 43 bathrooms and nearly 180,000 square feet. The inside is as extravagant as you could imagine and the outside offers sweeping views of the rolling hills and Blue Ridge Mountains. The drive down from the Mountains to the Piedmont took a little over three hours and we arrived in Chapel Hill around lunchtime. The defining place to eat is Top of the Hill (Topo) and we went with that. Food wasn’t actually that great (I had a very plain chicken sandwich), but the upper deck view is cool and the inside bar seems like a great hangout. Afterwards, we walked Franklin Street a bit and then went on campus, which had a cool vibe as students were enjoying a long-awaited warm and sunny day. Wish I got to the Visitors Center first, which had a walking tour guide and a better description of the buildings than my name notes of what I wanted to see. Still got to look at Old East, Old Well, Morehead Planetarium, Wilson Library and the Bell Tower. 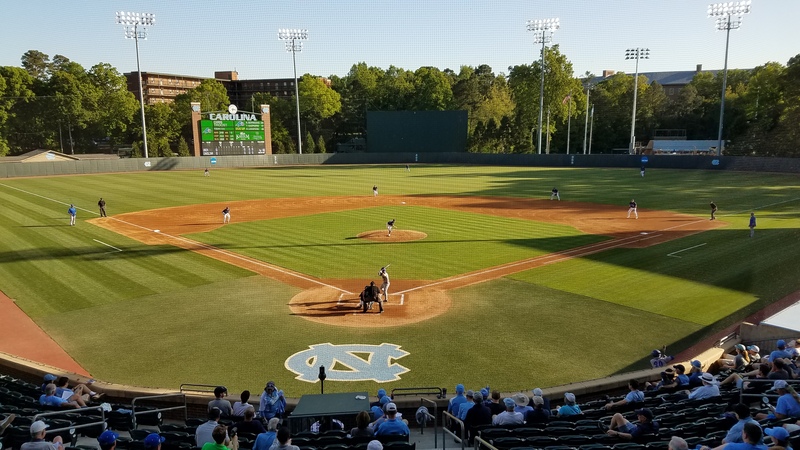 For the stadium visit, it was a UNC baseball game at Boshamer Stadium. Getting there was a mini-adventure thanks to mis-direction for parking on the website and then a lack if signage to the ballpark after walking out of the parking garage. Once we reached the stadium, we encountered a traditional modern brick facility with an open concourse above the green seating bowl. I did love the elevated bowl that began with seats about 10 feet higher than the field. UNC also did an awesome job with displays including a spectacular trophy room. The crowd was expectedly sparse for this mid-week non-conference game and it was a snappy start with 0’s on the board for the first four innings. Then Asheville scored two in the 5th before the Tar Heels put their foot down with a 10 spot in the bottom half. Bad news, the inning took 1 hour. Ugh. The game took 3:30 as UNC-Chapel Hill won 11-5. The second stadium in less than 24 hours comes at a cost: Education Day. I definitely am lucky to have an understanding wife put up with that and a side trip on a family vacation to Kinston, NC. It was really sad to drive down Queen Street and see nearly the entire center of town quiet and boarded up. But there are signs of a little hope and development as a luxury boutique hotel recently opened up and minor-league baseball is back. 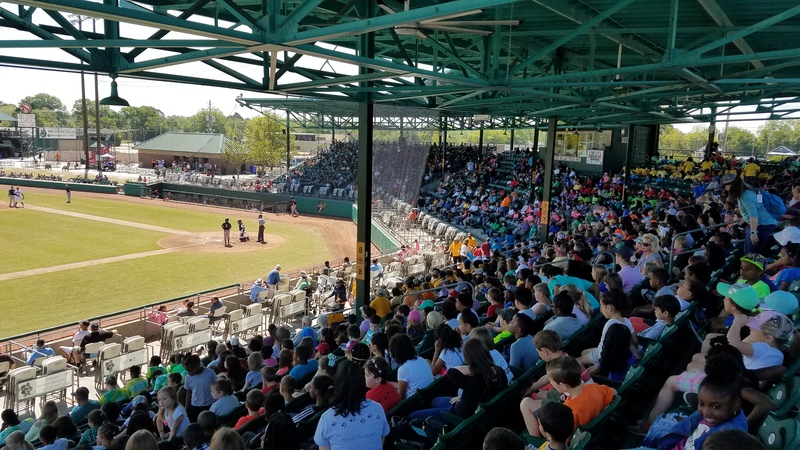 The Wood Ducks debuted in Historic Grainger Stadium last year and even won the Carolina League title. This park was built in 1949 and it is so wonderful. It’s everything my nostalgic self loves: completely covering roof (with ceiling fans! ), water tower in the background, occasional train horn. Pure bliss, except for the deafening school kids. This was another lengthy game as it lasted over three hours as well. Home teams move to 3-0 on this trip as we saw Down East defeat Buies Creek 15-3. After the game, I stopped at Kings Restaurant to pick up a bottle of their BBQ sauce and will use that on my Chicken and Pork this summer. It was then on to Carolina Beach, where we took a stroll on the beach and boardwalk before dinner and bed. Beach Day. 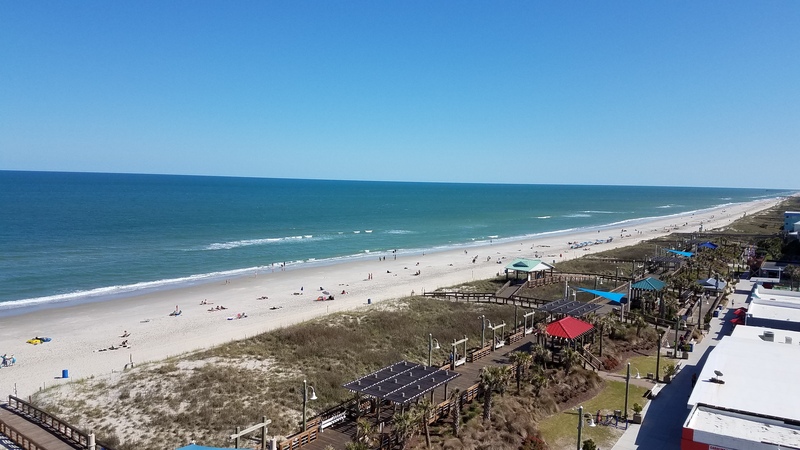 We got a hotel right on the ocean, which is great for spending time in the sand and surf. I’m not a big beach person, but Cheryl and Shayla are and they enjoyed the morning and midday with beautiful weather continuing. It’s still kinda offseason here, so many of the boardwalk shops weren’t open. For the afternoon, we went to the North Carolina Aquarium, which is in the Fort Fisher area. After dinner, it was a boardwalk stroll with some ice cream. We saw two cities today as we began in the Port City of Wilmington. It’s a great little place along the Cape Fear River, we just didn’t have things go our way today. The exception was where we started at the Cape Fear Museum. We walked into a great little program that was free for Ages 2-5 as Miss Pepper led the kids through a Crafts Program. That also gave us access to the museum, which I really wanted to see more of, but Shayla was obsessed with the Classic Toys room. That means we were stuck there longer when we wanted. After a solid lunch at Chops Deli, we walked the historic downtown. This is a mini Hollywood and I pointed out a few Dawson Creek sights for my wife, who was the exact genre that show targeted in its heyday. However, the spots (found on a TripAdvisor Forum) were barely recognizable from 20 years ago. There’s also plenty of tours and we picked the wrong one. Cape Fear Riverboats was the dullest waste of $12. I usually can find interest in something, but our guide was so dry and then when we spent 30 minutes travelling along the industrialized and undeveloped parts of the river, I wanted to fall asleep. Too bad the benches were breaking my back and the wind slapping me in the face. Can’t win them all. 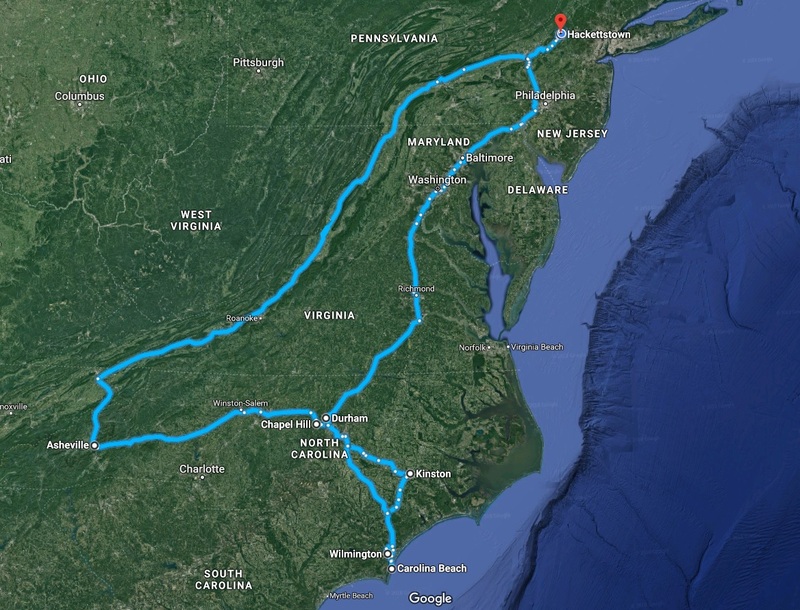 We then made the 2+ hour drive to Durham, which took a little longer because of rush hour traffic. The Bulls game coincided with “May the Fourth” and Fireworks, so that meant a packed house. 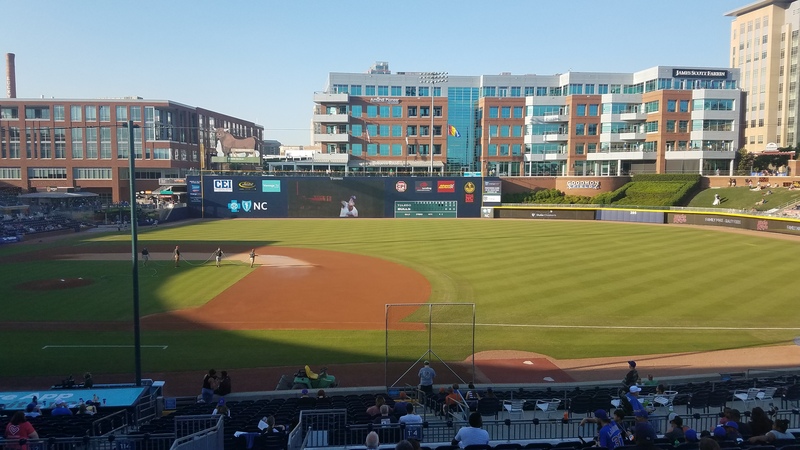 Durham Bulls Athletic Park is one of the best minor-league parks I’ve been to and the whole place has a very “major” feel to it. Nice design, complimented by excellent displays including their famous “Hit Bull, Win Steak” in left-field. Tremendous local beer options here as well. The game was a good one too and Durham scored in the 7th to take a 5-4 lead and hang on the rest of the way. Home teams finish 4-0 on this trip! I’ll start working on detailed stadium reviews a few days after settling back home. Our last day here in North Carolina and we stayed in Bull City. I’ve fallen in love with Durham and think that it is a fantastic place to live. Probably because I’m most impressed with all of the redeveloped tobacco warehouses that have turned into mixed-use spaces. First, we started at Sarah P. Duke Gardens, on the campus of Duke University. It is one of the top Gardens in the country and I can’t argue that. So much natural beauty to see and it is all free. What a great space to spend a morning or bring a picnic for lunch. It also gave us a chance to see Duke and the Gothic architecture on campus is impressive. I may not be a fan of their basketball, but the grounds are beautiful (better than UNC, sorry Chapel Hill). We went inside the Duke Chapel, a mighty impressive structure. 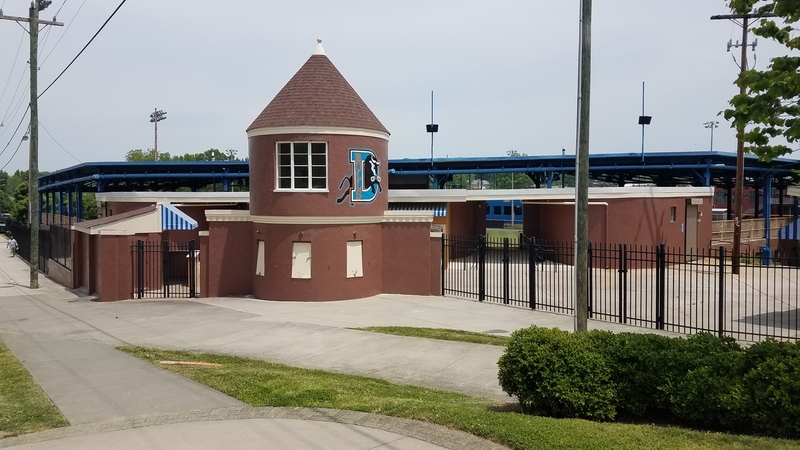 During the afternoon, we split off as Cheryl and Shayla went to the Museum of Life and Science while I went to Durham Athetic Park, the former home of the Bulls and scene of Bull Durham. The ballpark still hosts baseball as North Carolina Central uses it and they had a game against Florida A&M. Capacity may be too small for an official review, but it was well worth a visit for historical purposes. Watching a game here took me back in time and the comments from the peanut gallery in the back row made it all the more entertaining. Even better, I walked to 70 year old King’s Sandwich Shop to bring in my hot dog, fries and coke while watching the game. I’ve definitely had some great baseball experiences on this trip. I didn’t stay the whole time as I wanted to explore the city on foot more and I checked out Main Street, the Bull Statue, the Durham Museum and Brightleaf Square before heading back to pick up the ladies. Dinner was at Bullock’s and this was a taste of a true local BBQ place. Families were laughing and enjoying a great meal and I savored some succulent pork, ENC-style. And with that our trip was complete as a full driving day followed to reach home. Check back for updated reviews of each stadium on the right side of the page. 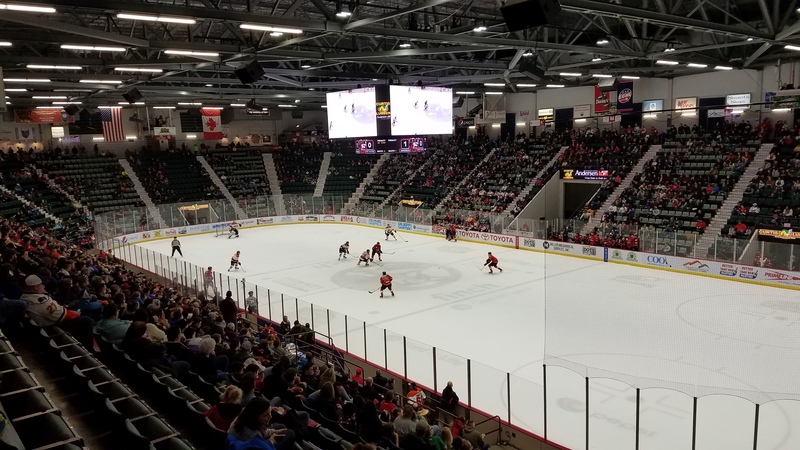 It’s been a rough March weather-wise in the Northeast, but thank goodness we got a break for a few days, as a Glens Falls – Lake Placid hockey opportunity only becomes a possibility every one or two years. My brother drove down to Jersey the day before to spend time with my daughter/his niece and then we left Friday Morning. Before Glens Falls, we stopped in Saratoga Springs, about 30 minutes away. This ritzy town was enjoyable to walk through and after lunch, we went to Congress Park to unfortunately find the museum closed. The spring water was available though as the fountains were running with the famous “healing” power of the mineral water this place became known for way back in the day. I tried the first one and it was refreshing, but the second and third, I just couldn’t get past that horrendous sulfur spell and carbonation. Wasn’t able to get myself to try Hathorn Spring One while Eric wouldn’t touch it with a ten-foot-pole. We went to Glens Falls for dinner and met a friend at the Downtown City Tavern before going to the arena. It’s amazing this tiny town has had professional hockey for so long and still does in this day and age. They’ve been close to losing hockey recently, but local ownership stepped up and the Thunder are in their second ECHL season. The building is small, but lovingly old-school. Just an opening, rectangular lobby in the front with corner food stands on the inside as the oval bowl steeply circles the arena. Way too many advertisements though, I mean, an insane amount. Definitely need to stop with the annoying PA saying “It’s another Queensbury Hotel Icing” in a soft voice or his grating yell of the “Catseye Penalty Kill…Catseye!”. 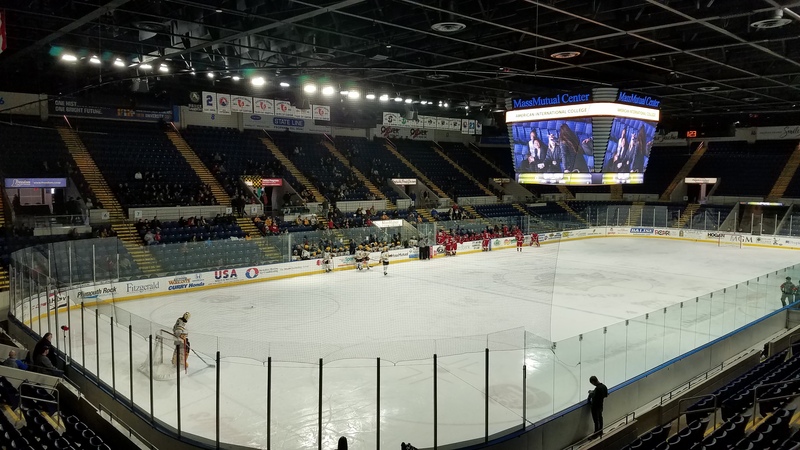 Outside of that, the atmosphere is great and it reminded me so much of my childhood days going to Rochester Amerks games. Fans knowing the Referee name, booing the scratching of a player, ringing cowbells. Even though the arena was half-full, the crowd really shined during the exciting Overtime session as the Thunder scored with 57 seconds left on a nifty, patient move by Shane Conacher as they beat the Fort Wayne Komets 3-2. On Saturday, we made the 1.5 hour drive from Glens Falls to Lake Placid. Mountain weather quickly showed it’s teeth as a seemingly quiet morning gave way to wind-whipped snow as we snaked to the resort town by running through blowing snow from fields onto roadways. We started at the Ski Jumping Complex, where the burning wind and occasional snow showers didn’t damper a trip up the ski lift. At the top, the area around the 120m tower had some cool signs and markers that we read before taking the elevator to the observation deck. Wow, what a view and what a feeling. The snow cleared enough to give us an amazing visual of the surrounding mountains. Then looking down at that jump, while watching kids going off the 90 meter was awesome. Afterwards, we drove into bustling downtown and parked at our hotel on the other side, the Lake Placid Summit Hotel. Lunch was at Big Mountain Deli and we hopped in and out of shops along this charming little town. Along the way, I kept picturing myself back to 1980 to think about how the Olympics must’ve been. We also took a walk on frozen Mirror Lake, while watching kids play hockey and sled dogs cross to the other side. It feels like another world up here! Then it was onto the Olympic Museum, a small, but well-done summary of the Games and impacts on Lake Placid. 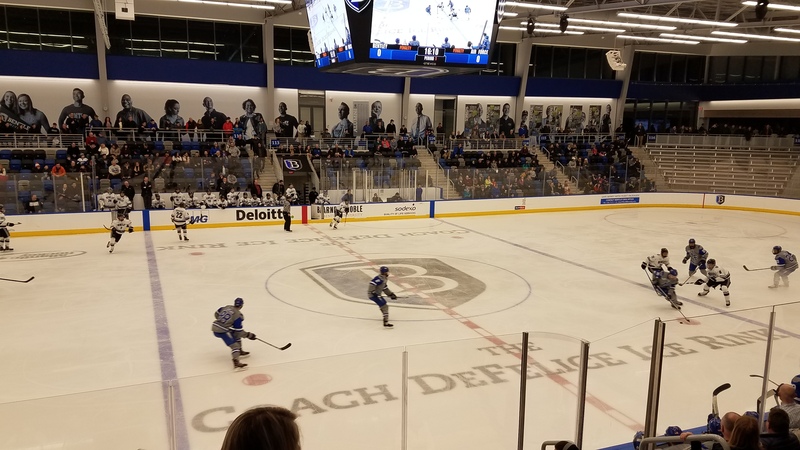 There was a youth hockey tournament going on as well and with the Museum being inside the Olympic Center that houses both the ’32 rink and the ’80 rink, it gave us a chance to tour the facility and for me to be in dreamland. The displays in the arena are really well done and both the lower bowl and scoreboard are first class. The upper-level though is really poor as they redid it so there is just a small balcony of wooden bleachers with most of seats obstructed by railings. Also the walkway/concourse behind the bowl led to quite the traffic jams and intermission long lines. All of this I can put up with though to soak in the arena history. More sightseeing in town eventually led to dinner, but we didn’t start early enough at our first choice: Smoke Stacks. An hour wait was too long, so we walked over to Delta Blue for a more manageable 15 minute wait. The Louisiana-based menu looked really good, but the food was just eh. In the ECAC Tournament the night before, Princeton upset Cornell while Clarkson came back from a 4-1 deficit to defeat Harvard in OT. 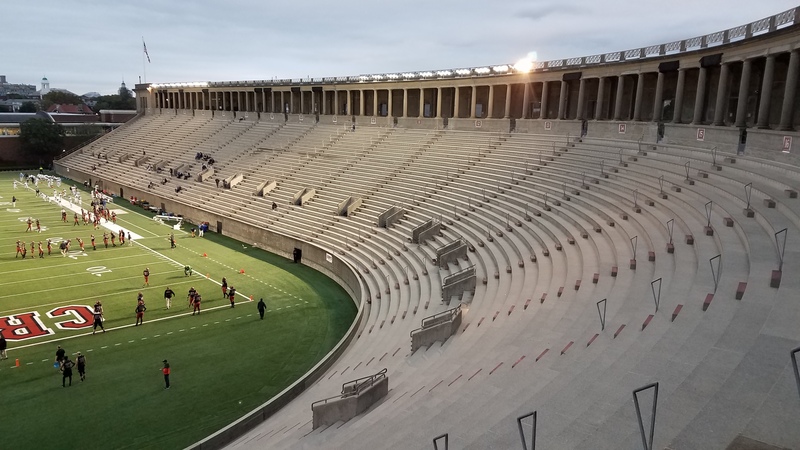 Thank goodness, because team fan support would’ve been low if it was Princeton-Harvard. The Golden Knights brought a very large contingent from Potsdam just over an hour away. Their green and gold colors filled the streets all day and they outnumbered Tiger fans in the arena 10 to 1. Frequent chants of “Let’s Go Tech” went for naught as Princeton took a 1-0 lead. It was a classic “underdog hanging on” in the third period, as the Golden Knights just couldn’t find the answer. Things were bleak and Clarkson had one last chance…and it went in! a miracle! 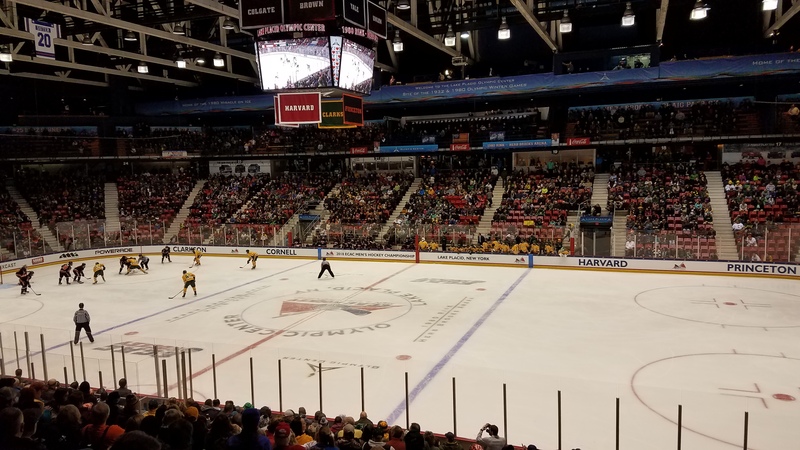 😉 Nico Sturm’s deflection with 6.4 seconds left sent Herb Brooks Arena into hysteria as Clarkson fans went bonkers, jumping up and down all around. Eric and I just stared at each other with mouth’s wide open, soaking in the craziness. What a moment. The building digested what happened in the 15-minute intermission and my gut started swaying towards wanting Princeton. With Clarkson able to get an At-Large bid to the NCAA Tournament in spite of a loss, Princeton was win or go home and what a heartbreaking way for the go home part to happen. Yet, sure enough just 2:36 into the extra frame, Princeton’s Max Becker won it and the Tigers went crazy, celebrating their first ECAC title in ten years. They beat the #1, #2 and #3 seeds to do it with one of the conference’s most remarkable championship runs ever. The game capped a truly special weekend and the 15-minute walk back to the hotel in the -5 degree Lake Placid air was one I’ll never forget. For a sports and stadium nut like myself, I do believe.